A crime-fighting email that warned householders of a rogue trader targeting homes in Highfield has helped police to catch the suspected crook. Police sent out a message via its Online Watch Link (OWL) urging people to be on their guard following reports of a man travelling in a white van and offering gardening services. A 21 year old man from Woking has been released on police bail while investigations continue. Safer Neighbourhood Inspector for Dacorum George Holland said: “Through the Online Watch Link (OWL) system, residents regularly receive updates from their local officers about crimes occurring in their area, crime prevention advice, witness appeals and information about local events. “In this case, we contacted residents with information about a suspected rogue trader operating in Hemel Hempstead. 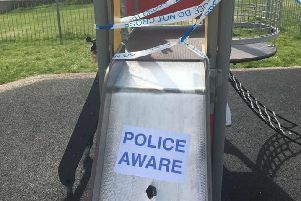 “The response from residents was overwhelming and we had a number of calls from people sharing information about sightings and suspicious activity. I’d thank people for taking time to contact us. A man was subsequently arrested and has been released on police bail. Anyone who is concerned about rogue traders in their area or witnesses suspicious behaviour can contact police via the non-emergency number 101.